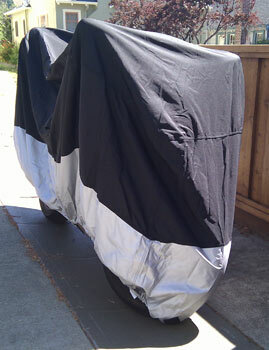 I have always had a fit problem with motorcycle covers. My Givi topcase is the problem. 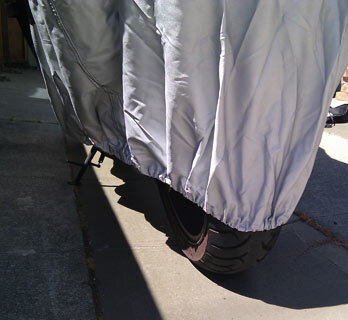 The “universal” cover that fit my V-Star does not fit my Kawasaki, it barely fits over the tail and leaves my whole tire exposed. Formosa Covers recently offered me a cover to try out and assured me that it would be a good fit. My first impression was favorable. The cover comes with a cable and lock as well as a convenient backpack for storage. The backpack has adjustable straps wit buckles that would allow you to wear it or lash it to your luggage. The material of the backpack is the same as the cover, with flares of reflective, heat resistant material for visibility. The cover fit well on my bike. It covered all of the engine, as well as the chain and brakes. The only problem is the elastic tether that attaches eyelets on either side of the bike. It is in direct contact with my pipe and would have to give my exhaust some time to cool down before attaching it. Nonetheless, the cover should stay in place with only the elastic band around the base of the cover to secure it. I would have prefferred that the cover go all the way to the ground, without letting wind get underneath the cover, but for a bike with the luggage setup that I have, it is better than anything else I have seen. Formosa has designed vents on both side to prevent the cover from becoming a kite. The quality and fit are exceptional for prices starting at $20 for their lightweight series up to $50 for their large dresser covers. If you park your bike outside, you need a cover and from what I have seen, Formosa will protect your bike from the elements. Formosa Covers provide a wide range of covers, including Motorcycle covers, Golf cart covers, Car covers, Jeep covers, Tractor covers, RV covers, ATV covers, UTV covers, Van covers and Conversion Van covers & Tent Trailer covers. Copyright 2001 - 2019 WhyBike.com. All rights reserved. Fast and accurate insurance quotations.